The US Navy has decided to cut back on its initial projected shipment of 69 F35 fighter jets this month, and has reduced the number of aircraft it will recieve to just 36 planes, almost half of the original 69. Speculation persists as to why this cut was made; the Air Force will still, according to analysts, move forward with its original plan of ordering 238 jets in total, although they have postponed this final announcement for one year. 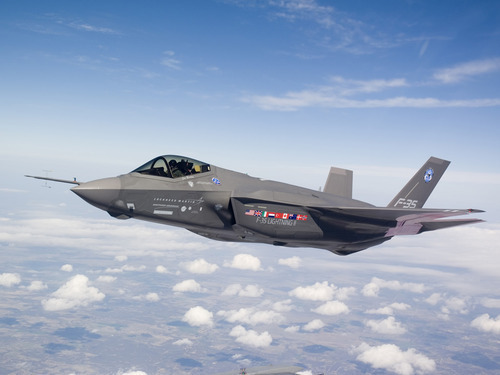 According to Pentagon Comptroller Robert Hale, the move to purchase fewer jets does not indicate that the military is underwhelmed with the jet’s performance capability, but rather it was based primarily on budgetary considerations. Nevertheless, as he stated in an interview with Reuters, the plan is still to purchase a total of 2,443 F-35s over the next few years. However, the F-35 project has suffered from some significant obstacles, most notably the large pricetag. The projected 2,443 fighter jets would cost $392 billion, a 68 percent increase over original projections from back in 2001. Although the military first decided to buy nearly 3,000 jets, the plan was cut down to 2,443 jets due to a high price. Furthermore, performance and manufacturing setbacks have also hobbled the program as it unfolded. Last year, a Pentagon report found issues with the jet’s internal software, while leaked budget review documents suggested that some within the government are considering cancelling the project. President Obama’s goals of scaling back overseas military operations while remaining capable of waging war when necessary is why Defense Secretary Chuck Hagel is planning to reduce the US forces. Under Hagel’s proposal, US troop levels would fall somewhere between 440,000 and 450,000, the lowest since the end of World War II. In light of the expanding crisis in Ukraine and the Crimea however, a downsizing of the US armed forces might alarm some Americans who are concerned about America’s future on the world stage.